This recipe is special. It was created over 3000 miles, several weeks, multiple Facetime calls, several emails, many laughs, a few snarls, a bit of frustration, and is just flipping delicious. You know how Batman has Robin? Well, I have Morgan. She is kind of like my wingman in the kitchen...only her kitchen is on the other side of the country from mine. Morgan and I go way back. Back to the days of when husbands were just boyfriends, babies were nowhere on the brain, and the festivities of a Saturday night didn't really start until after 10pm. Morgan and I were the closest of friends and even lived together for a while. Our perfect lazy Sunday consisted of drinking red wine as we watched The Food Network in our pajamas and then racing into our tiny kitchen to recreate the beautiful meals of brilliant chefs. Morgan has always been my kitchen sidekick, so when I moved from New England to California, I found myself a bit lonely in the kitchen. However, thanks to the miracle of the internet, Morgan and I are still able to get our culinary creativity on together despite the miles between us. We shoot emails with recipes and notes back and forth, laugh about our kitchen disaters over Facetime, and send victory text messages when one of us has finally nailed a recipe that we've been working on. It is like she almost cooking in the kitchen with me (since half the time we talk, one or both of us are in our pajamas (but hey, thats motherhood)). This blondie recipe actually started out as her vision and has both of our fingerprints on the final product. 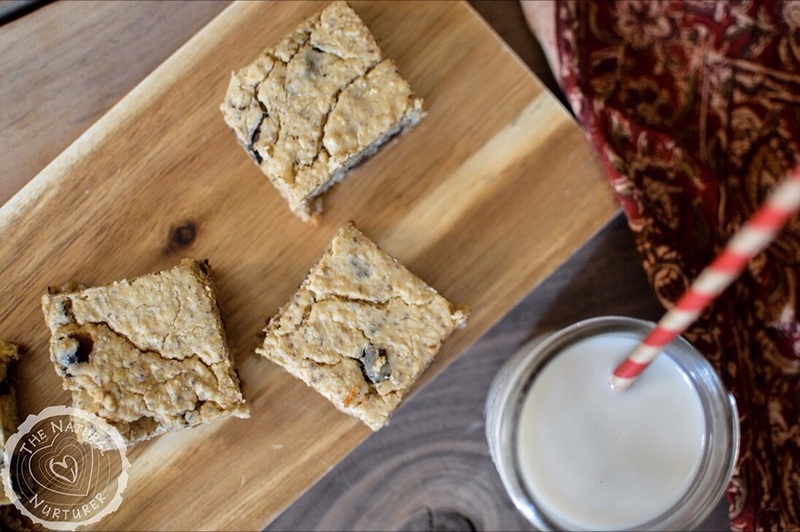 Sweet and cakey (without being overly rich or heavy), these healthy blondies have no empty calories and are loaded with protein-dense beans. They will satisfy even the meaniest sweet tooth without resorting to the box of Chips A'hoy you have secretly stashed in your bedroom closet. 1. Preheat oven to 350 degrees F and line a 8x8 pan with parchment paper. 2. In a small bowl, combine the warm water and the ground flaxseed. Mix and set aside to gel into a "flax egg" for 3-5 minutes. 3. Pour the rolled oats into a food processor or blender. Pulse until the oats have a flour consistency. 4. Pour the flax egg mixture and all other ingredients except for the chocolate chips into the food processor. Blend ingredients until the batter is smooth and without lumps. 5. Add the chocolate chips and pulse briefly just to mix them into the batter. Pour batter into the lined pan. Bake for 30 minutes or until the edges get slightly brown and a toothpick instered into the middle comes out clean. 6. Allow blondies to cool completely before removing from pan and slicing into squares. Store in fridge in an airtight containter or individual wrap them and freeze.